TLV Euro Engineering was selected by Ringwood Brewery to supply its new boiler house with steam equipment, including the COS-R pressure-reducing valve, which it was offered on a sale-or-return basis. The performance of the first COS-R gave Mavin, the brewery's chief engineer, the confidence to order most of the new steam equipment for the boiler house from TLV. Founded in 1978 by Peter Austin, Ringwood Brewery currently produces approximately 40,000 barrels of distinctive beers including its renowned CAMRA award-winning Old Thumper. After the brewery was acquired by Marston's a few years ago, a new boiler house was installed, at which point the brewery's chief engineer and president of the Brewing Engineers Association, Bob Mavin, reviewed available sources of specialist steam equipment. Having been talking for some time to TLV, which was looking for an opportunity to supply steam equipment to Ringwood, the brewery was offered a trial of TLV's COS-R pressure-reducing valve on a sale-or-return basis. The performance of the first COS-R gave Mavin the confidence to order most of the new steam equipment for the boiler house from TLV. As several of Ringwood Brewery's old-style steam traps were failing, even though Ringwood's own test equipment suggested otherwise, TLV was also invited to undertake a steam trap survey. Of the thirty traps on site, eight were found to be faulty, which was costing the brewery in excess of GBP3,000 in wasted energy per year. Ringwood now commissions TLV to undertake annual steam-trap surveys and a rolling steam-trap replacement programme has been initiated to enable Ringwood to continue increasing its efficiency. TLV has now supplied additional equipment for the boiler house, including pressure-reducing valves, flow meters and steam traps, as well as some isolation valves. In addition to the surveys, Ringwood also undertakes its own checks on all steam equipment on an annual basis and has found that no TLV product has failed in the four years since the new boiler house was commissioned. In fact, as other steam equipment fails, TLV replacements are ordered and installed. At Ringwood, steam is used extensively throughout the process from mashing in, where malt is mixed with water and heated to produce sweet wort, to the wort kettle, where it is boiled for varying times and evaporation rates, depending on the beer type. Steam is produced by the Ringwood boiler at 8 bar and reduced by one of TLV's COS-R pressure-reducing valves to 4 bar for the majority of the brewing processes. However, two other COS-R's have been installed at locations around the brewery to further reduce the steam pressure to 2 bar for cleaning and sterilization applications. Ringwood has also installed a TLV flowmeter to meter the main steam flow from the boiler house and help to correlate the gas-to-steam usage. 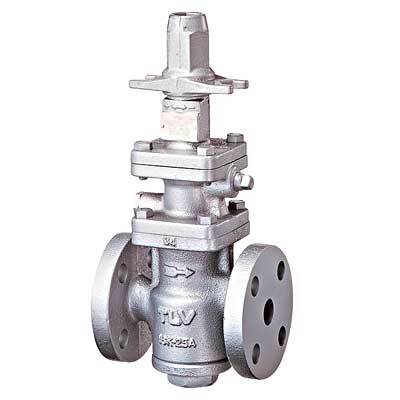 Mavin said TLV's steam equipment has good build quality and that the company's procedures for installation, operation and maintenance are carefully considered and thoroughly engineered. He said that steam equipment has traditionally been heavy, cumbersome to handle and awkward to use, but TLV's industrial-design approach fits aesthetically with Ringwood's new building and, unlike most steam equipment, is pleasing to look at and use. Mavin added that TLV has been professional in its approach and its engineers have been helpful.